Former Longhorns standout now heads to Augusta National with questions over his game ... though that's one place where he's had plenty of answers. Jordan Spieth is still trying to break his slump. It’s one that’s been going on for quite some time. The former Longhorn’s last-ditch effort to make the weekend at the WGC-Dell Technologies Match Play slipped away in the closing holes of his Friday match with the event’s defending champion and two-time Masters winner Bubba Watson, who had led 4 up through four. Trailing 1 down at the short par-4 18th, and needing a hole-out eagle from the right greenside bunker to have any chance, Spieth splashed his ball onto a downslope before it slid just past the cup. As he climbed out of the bunker, Spieth slammed his wedge against his bag in frustration, knowing his shot at the weekend was over. Watson’s 1-up victory eliminated Spieth from group play at Austin Country Club for the third straight year. Still, speaking with reporters off to the side of the green afterward, Spieth’s confidence in his struggling game was exactly where it was when he arrived this week. Spieth’s nightmare start Friday ended up being too much to overcome, despite his best efforts to pull back into the match. Spieth did reel the match back to 2 down by No. 9 just as he planned. But from there he let prime opportunities go to waste. He missed a six-footer for birdie at the par-5 12th that would have cut it to 1 down. Then he made another error at the par-5 16th, failing to get up and down from just in front of the green for birdie, which would have pulled the match all square. At the 18th, Watson’s tee ball appeared in trouble in the air before it ricocheted off some left trees back onto the fairway, allowing him a routine up and down for birdie that closed out his victory. Had Spieth forced a halve, he would have been in a sudden-death playoff with Kevin Na. 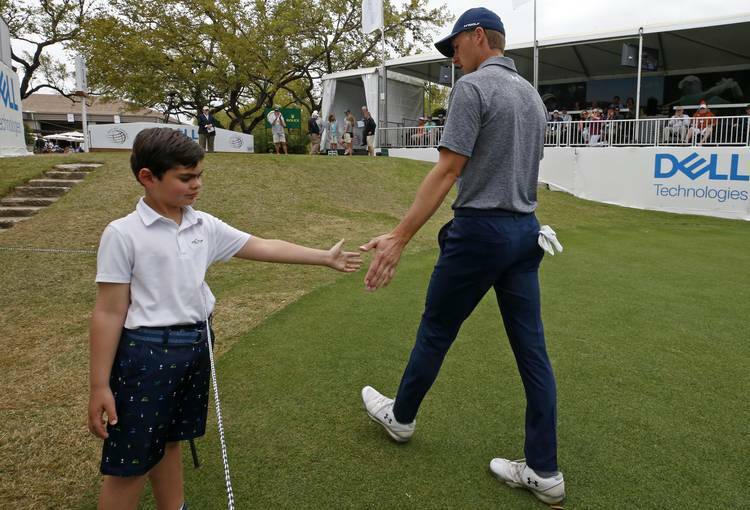 Spieth arrived in Austin this week noticeably upbeat about his game, despite struggles that have continued to plague him for the better part of the past year. Since November, he’s missed three cuts and finished no better than a tie for 35th in eight starts. His most recent outing at The Players was a missed cut, where he fired a 76 in the first round. He’s failed to break 75 a whopping five times in his last four tournaments. Even after all that, he wasn’t worried in his Tuesday presser. “I feel good about my game right now,” Spieth said. Spieth went 1-1-1 this week, and he will head to Augusta National with lingering questions. But it’s a place where he’s been able to find plenty of answers.